Photographed in transit by my Fourthborn, aged 11, as we headed west on the A303 on Saturday afternoon. Question: what makes them flat on the bottom? Air cools as it rises, and when the air reaches an altitude where the relative humidity is 100%, water vapour in the air forms droplets on particles, and you have a cloud. Air tends to move in large, stable parcels, and it rises uniformly over an area covered by the parcel. This is why most clouds are flat-bottomed - the condensation occurs at the level of the cloud base. 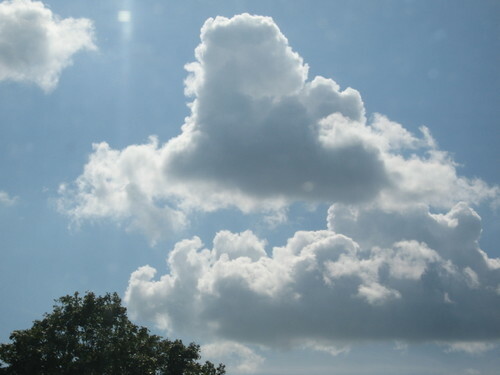 I know I leave nothing but pointless comments on your blog, Dave, but I am forced to do so again just to say that I do love a photograph of a cloud. I was disturbed, however, by this question of a cloud's flat bottom. It has never struck me before and I couldn't stop thinking about it. I've now discovered the answer. It's to do with the point at which water droplets form as warm air rises. It suppose it's a bit like boiling water turns to steam at 100 degrees C. Well, water condenses at a certain level, which in terms of altitude, means water droplets form a a certain point, forming a flat bottom. More than anybody needs to know about clouds, I think.